Hands up if you hear “400 Oak St” whenever Kmart is mentioned. My previous role was not a lot of interaction with other staff members. Of course you would say hi, but I wasn’t in the same room with them for hours at a time. 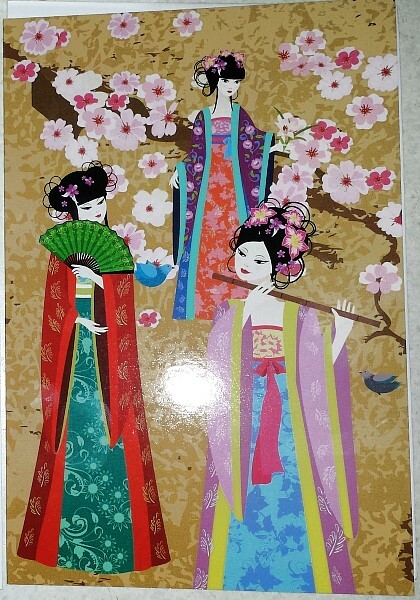 For an Aspie that can be challenging but I am at a place now where I have done a lot of work on that and I am getting along ok.
One of the other ladies had been to Kmart and bought some gorgeous glitter pens for $3. 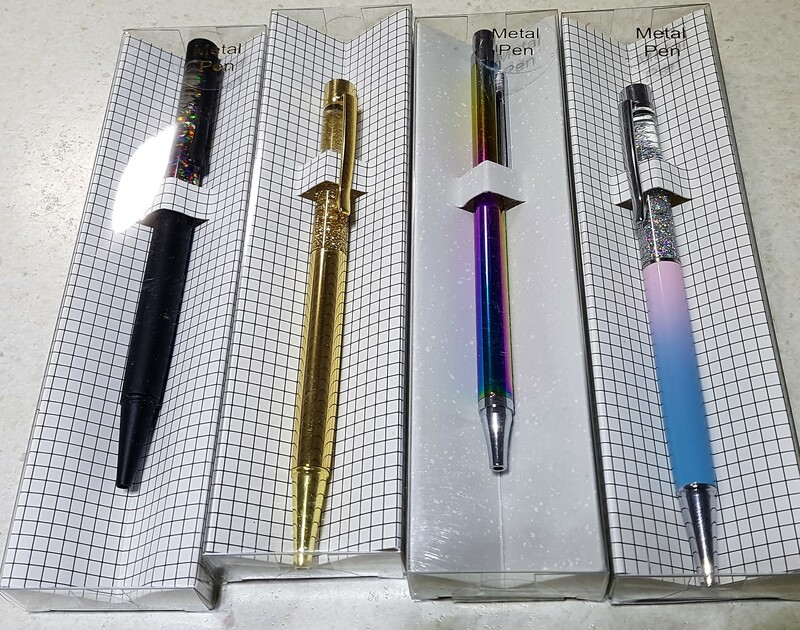 Not to be outdone in the sparkle department, I headed off that very same day to investigate further, and purchased one $3 pen. It turns out these pens write beautifully, you twist them to bring the nib out which I am a huge fan of, and the metal heats up in my pocket so whenever I pull it out to use it, it is lovely and warm. 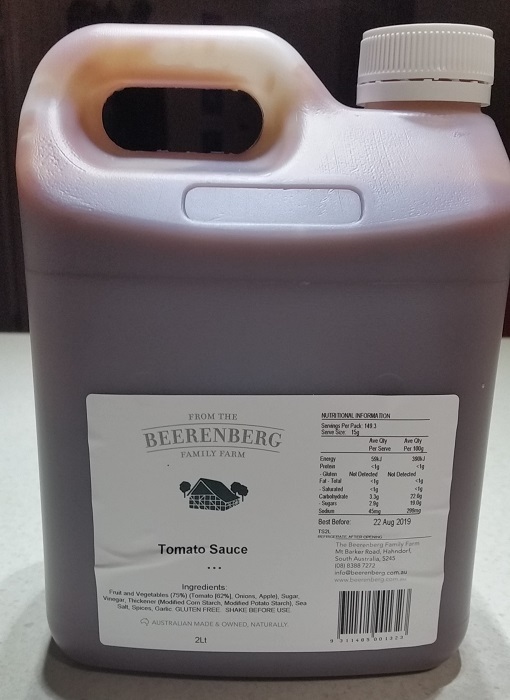 As much as I love my Beerenberg tomato sauce, I do kinda resent having to pay $4.45 for a 300ml bottle which last us maybe a week in sausage roll season. And because we have chosen to take sausage roll season into the summer this year with our meatballs in a tin, which is essentially sausage rolls without the filo pastry, we have been consuming quite a lot of sauce. When a family member travels to RADelaide (yes that is what those of us who lived there but left do call it, because we do still love it) we make one small request. 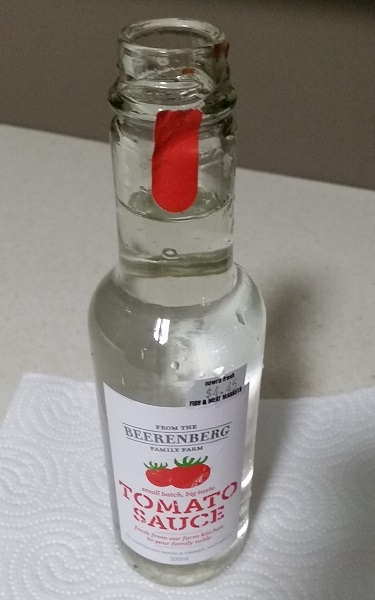 Can you visit the Beerenberg factory shop and pick us up a flagon of tomato sauce? Pretty please? And our wishes were granted. 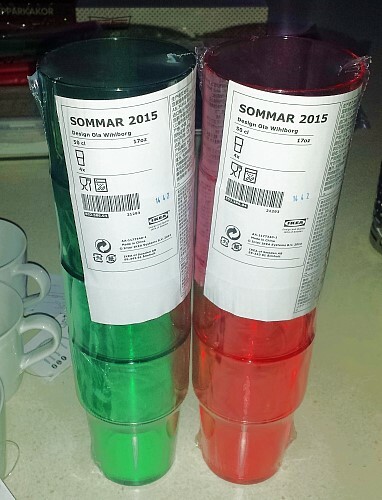 300ml VS 2 litres. This should last us a short time! ;) I have no idea how much the flagon was as I did not buy it. But you better believe we will enjoy every single drop of it. 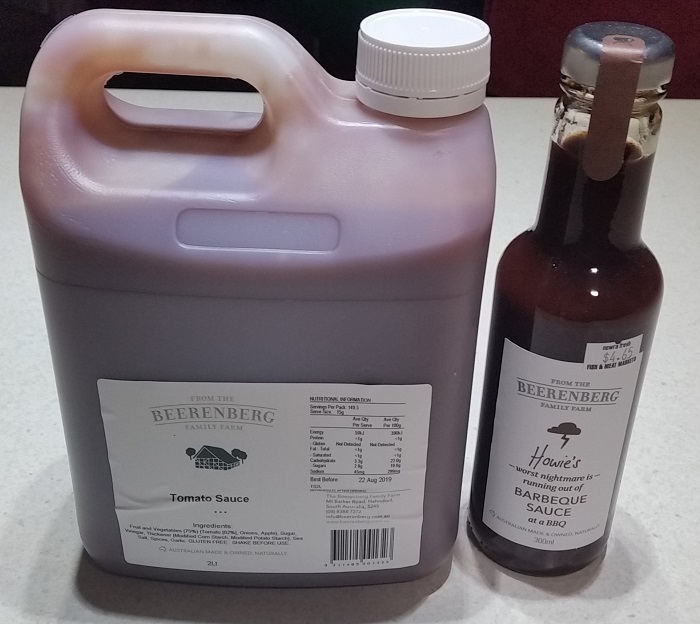 If you have not tried Beerenberg tomato sauce, I highly recommend it. I think what makes it so incredible on the tastebuds is the apple they add. They make a large range of products and I have never had a bad one yet. The jams are lovely, too. The one thing I do not love are the labels with random names on them. At least they changed the tomato sauce one back to a normal one. I remember when I was young and I got my first ever purse and began to carry money with me regularly. It was exciting and slightly scary in a way. There suddenly was a possibility that I could forget my purse, or lose money, or have someone try and take my money from me. I really never became someone who enjoyed purses or handbags. To me they were annoying, something to have to keep an eye on, something to have to hold onto. I was not into the “fashion” aspect of things very much as a teenager and certainly never owned an expensive handbag – still to this day I believe the most I have ever spent on a handbag would be around $100. Perhaps if I did enjoy fashion or have an expensive handbag I might have grown to enjoy it. The older I got, the more I wanted to carry with me. Lip balm, hand cream, tissues, a bottle of water, a diary, a calculator back in the days before one had a mobile phone with one, then of course the mobile phone appeared and that became another item to carry. Spare batteries for the mobile, a camera, the list grew and grew until my handbag was quite heavy. What is worse, I felt like I actually NEEDED to have all that stuff with me everywhere I went. 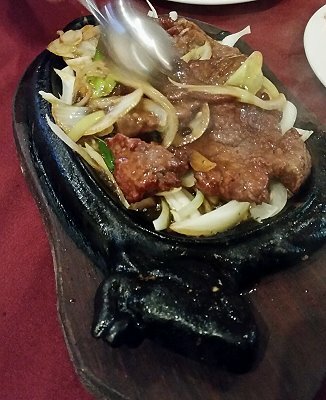 It became an obligation and not one that I enjoyed. Then the stores began with their loyalty cards, and those began to pile up. And up. And UP. I even had loyalty cards from stores in the USA in my purse! The security of my handbag was another troubling factor, for me. I’ve always been a backpack or cross body bag person, and you do hear stories where the strap gets cut and away goes your bag. Though these are usually in countries I would not be travelling to, there is always a chance it can happen here. The turning point for me was in early 2016 when I began to go to the pool regularly. To be on the safe side, I did not want to take anything with me. No phone, no purse, no license, no cash, nothing at all. Just a bottle of water and my gym bag with my towel and dry clothes to change into. To my surprise, the world did not end. I actually survived without those things. This started my mind down a path – what if I actually stopped carrying a purse all the time? What if I stopped carrying cash? Is it possible to go everywhere I want to go and pay by eftpos or credit card? I began to tick places off the list of places I usually go. 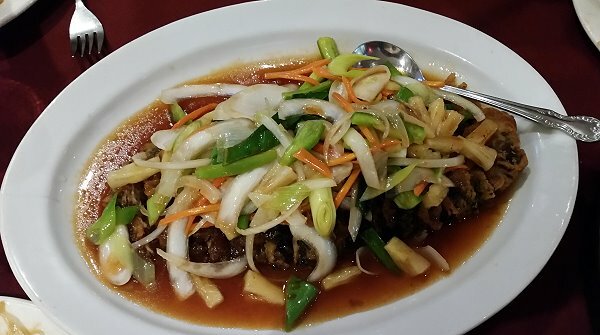 In reality there were only two places that do not accept cash – the local markets and one local eatery. Though a lot of places at the markets DO now accept cards, too! So when I saw TVSN having a sale on Travelon which does contain a lot of security features including a strap that cannot be cut and RFID protection, I put in an order. That was back in July, and several months have now passed – all of which, I have been mostly cashless. 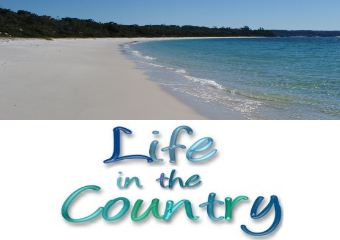 I have taken out cash on the following occasions – to get my car washed – to go to the local markets – to go to a food fair. The Other Half carries cash in his wallet so if I go somewhere with him and need cash, chances are he will have some. But realistically I have not needed cash 99% of the time. What about minimum Eftpos limits? Some places do have a minimum eftpos amount – this is usually $10. The only time I ever spend less than $10 is at the supermarket when I am running in to get one or two things I need, and all the local supermarkets here allow eftpos transactions at any amount, especially the self serve checkouts. What about credit card charges? It really annoys me when the stores charge for using a credit card, but it is not a deal breaker for me. Usually I can just use eftpos instead in those places – eg Aldi – and they tend not to charge for that. Not having to handle cash regularly. For a germophobe like me, cash is a real nightmare. Cash is absolutely covered in germs! Overall, going cashless has worked for me. Would it work for you? The easiest way to find out is to just do it. 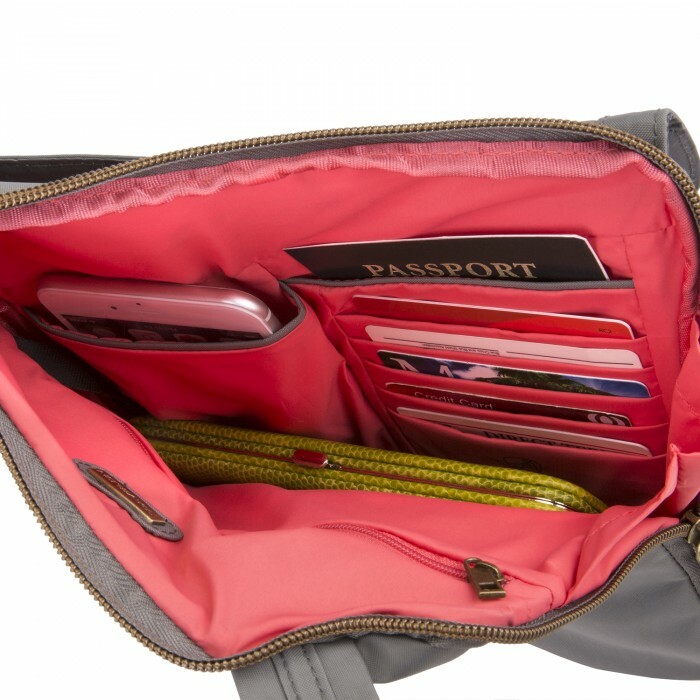 If you want a safety net you can keep a $20 or $50 hidden in a safe place in your bag just in case, you can dispense with the coins entirely and just carry your cards with you. 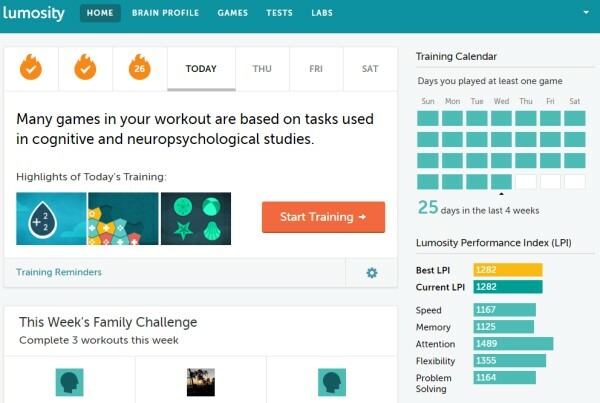 Every day at 6:03am, Lumosity sends me an email to remind me to brain train today. You can set the reminder emails to be morning, afternoon or evening. I like morning. I have also set myself a couple of reminders on my mobile in case I forget. When you click on start your workout, you arrive at this summary screen which shows you an overview of where you are presently, and tells you how many days in a row you have trained for. A workout is 5 games. 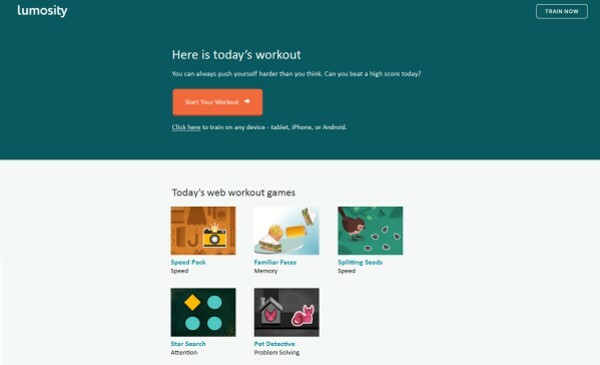 The games change from day to day, to try and give you some balance in your brain training. When you finish each game you see this screen which tells you how todays result compares with your previous scores. 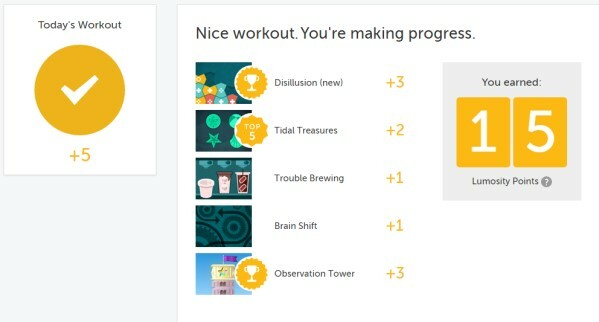 I do believe the training works because I have seen huge improvements in my performance *outside* of Lumosity over my time using Lumosity. My short term memory is a lot better than it used to be. My basic mathematic skills have improved enormously – this from the person who hates maths generally and failed maths in school. 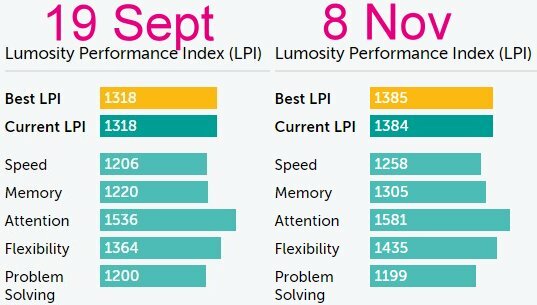 You also get to see this with a measurement called Lumosity Performance Index – above you see my numbers for the 19th of September, and then the 8th of November. These number do fluctuate depending on the daily training and if I have a very bad training moment in a problem solving game, it does get reflected in these numbers. My LPI when I started training was a mere 826 vs 1384 today. 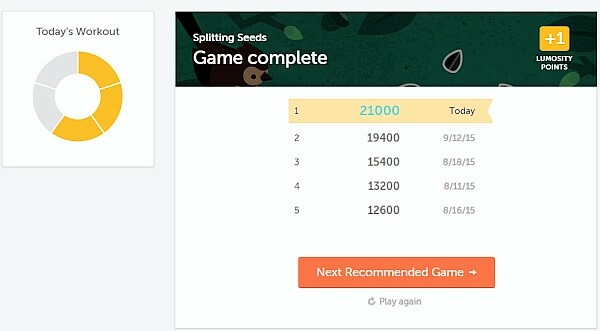 At the end of your five games, you get a summary like this – the trophies mean I got 4 personal best scores out of 5 games which was a pretty huge day for me. I do notice a difference in results based on the time of day I brain train. Somewhere between 1pm-3pm is the best time for my brain. 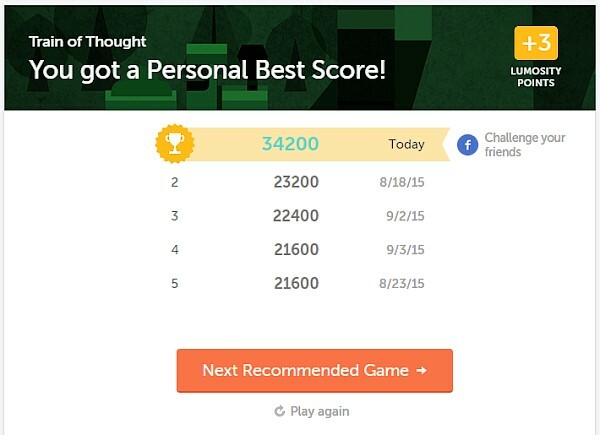 If you got a score in the top 5 scores, you also get a little top 5 symbol. 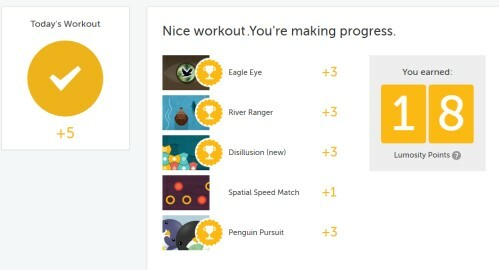 You are given Lumosity points for each game you complete – 1 point for completion, 2 points for a top 5 score, 3 points for a personal best score. Do you brain train? If yes, how often? Coco Chanel once said – Before you leave the house, look in the mirror and remove one accessory. 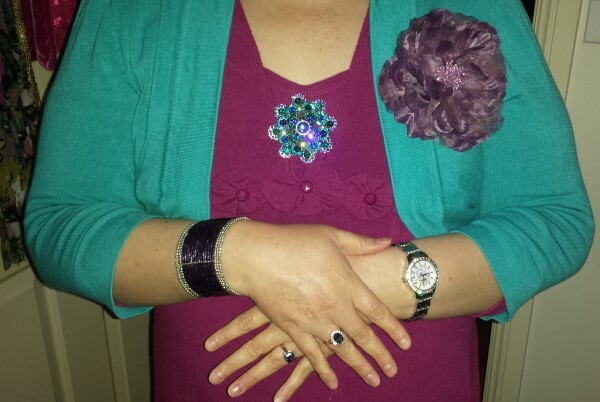 Snoskred says – Before you leave the house, look in the mirror and add three more accessories. I’m loving that huge purple flower. It is a little bit Carrie Bradshaw. 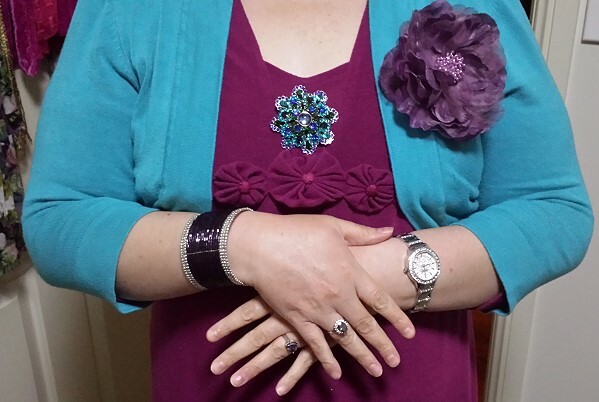 The flower has a pin and a clip on the back so you can use it for hairstyles or as a brooch. 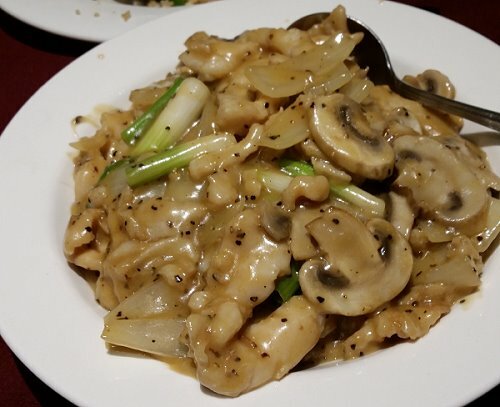 When it was time to take the Aunt and Uncle back to the airport after their visit in August – another Aunt and Uncle were also going somewhere that day – they were flying to China. Arrangements were made for a trip using both cars because the Chinese trippers had 4 very large suitcases full of vitamins and baby formula. Added in was a meeting with my sister and her partner for lunch at the St George Rowers Club. 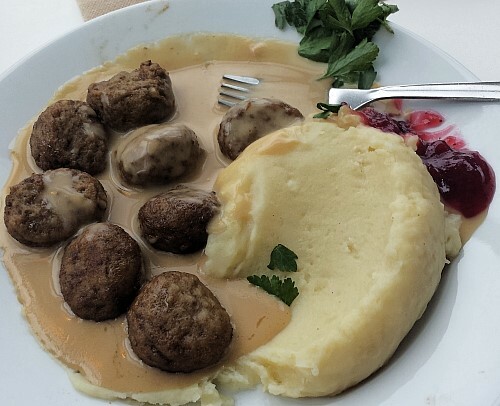 Because we’d just spent a week with everyone toodling and gallivanting, and we wanted to make sure my sister & co had plenty of family time, we dropped them off at the Rowers and headed to the very close by Ikea at Tempe for a Swedish meatball lunch, and to pick up some items we needed. 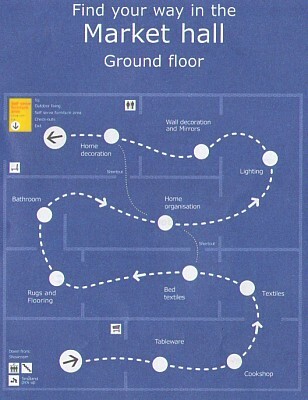 Over our many visits to IKEA, I have discovered the short cuts between various areas. I spotted a staff member going through a very large plastic door to one of the other sections – there was no sign saying staff only so I figured there was no reason I couldn’t use that door myself. Then I found other doors, and on one visit we were really hungry and discovered if you take a left at the top of the escalators, you could go right to the cafe. What we most needed were tealight candles and large square oven trays. 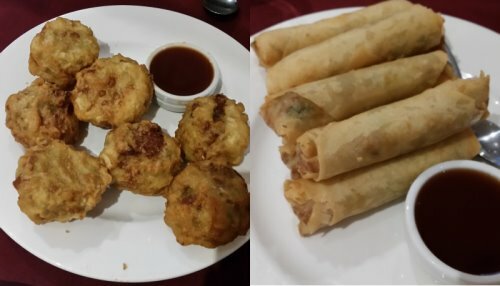 They had some new flavours to try – the coconut one is very awesome. 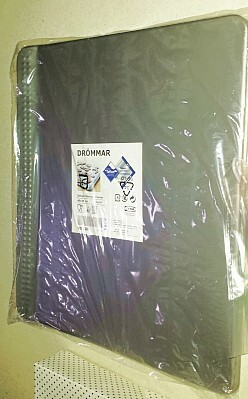 These DRÖMMAR oven trays are huge and fit nicely in our new oven. I also got some more of these cups which I’ve had several sets of – these ones are a different colour. Christmas colours, you could say. Two of these cups = one bottle of Soda Stream. 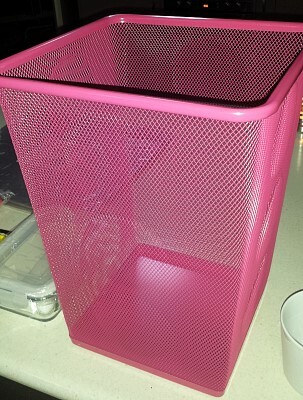 They had my favourite rubbish bin in pink this time which I could not resist. We thought these mugs were a decent size for the second coffee cup of the day, and we’ve been enjoying them afternoons when The Other Half arrives home. 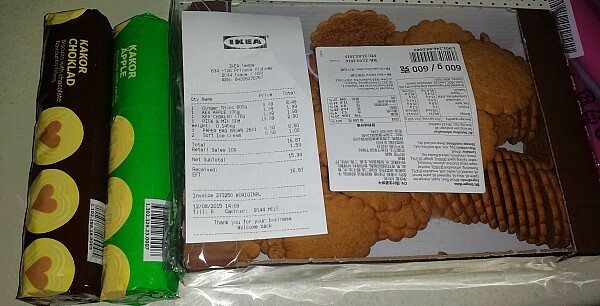 I like mine with a side of the ginger Ikea biscuits we bought. 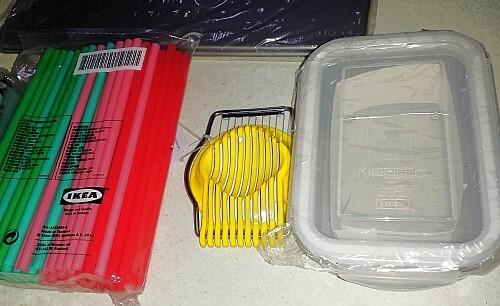 I got some straws for spring and summer milkshakes and smoothies – I picked up a second egg slicer as I was using our present one daily and thought a second would be handy – we thought we would try this glass storage container and if we like it next time we are there we will pick up some more. 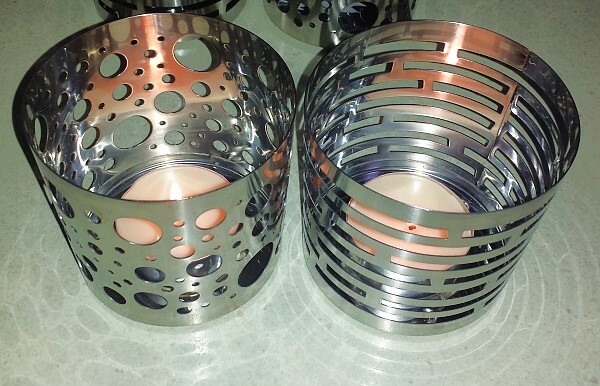 I spotted these gorgeous metal candle holders near the bathrooms next to the restaurant. 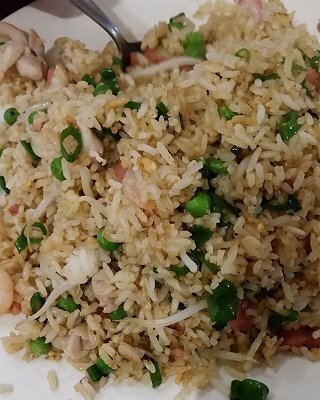 I did not pick any up, thinking they would be found in the market hall. 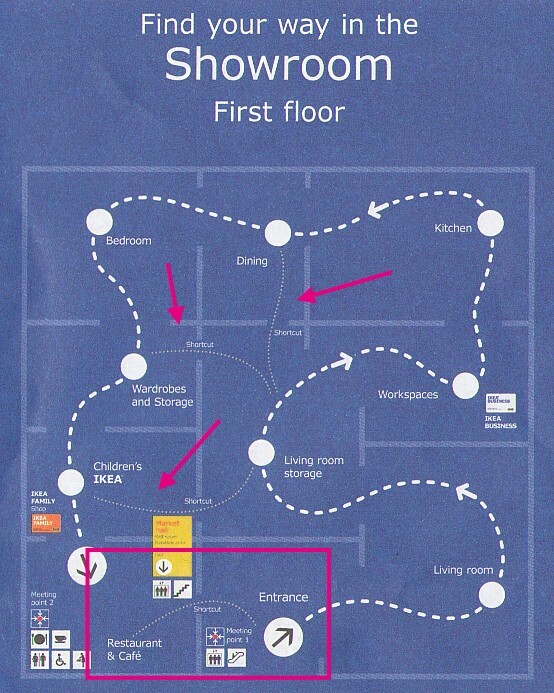 Of course, they were nowhere to be seen there, and I had to trek all the way back upstairs. 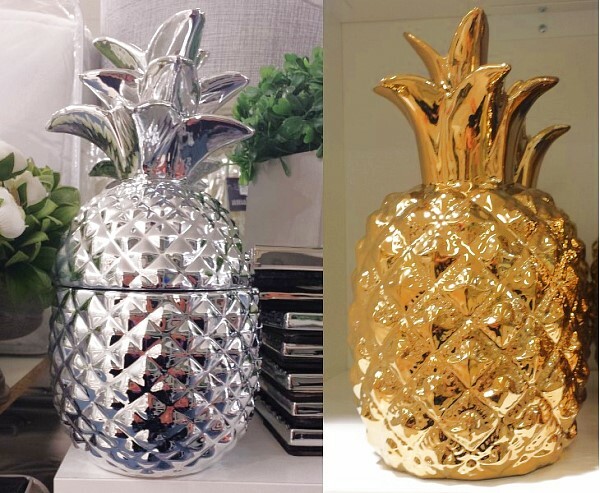 I’ve got a silver pineapple and now these, there is a bit of a silver theme running on my candle shelf. 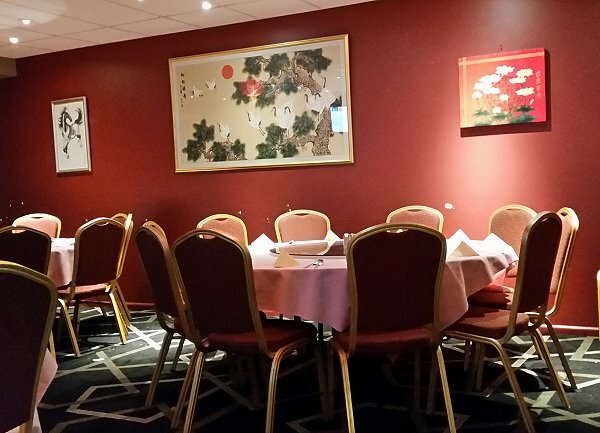 I love that they reflect different shapes onto the wall. 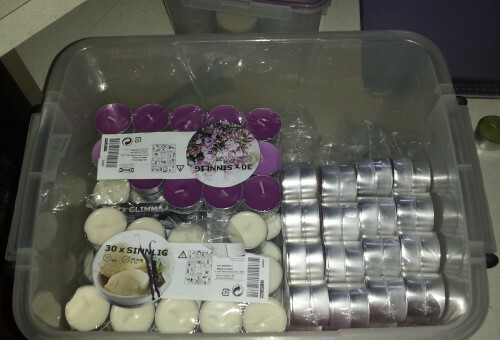 I took a couple of candles from each packet to put in my small container and stored the rest away together in the candle container. They will keep me going for quite some time, even though I am burning candles daily here. We also loved these bathmats. 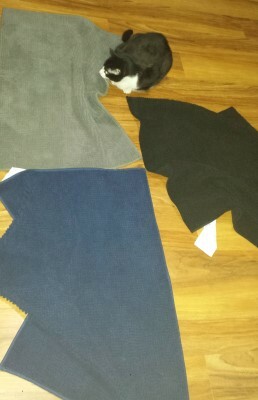 We put them on the floor for the kitties to sniff and roadtest. We have one bathmat with an inside of memory foam and neither of them will walk on it, because it feels weird to their feet. They like these new ones, though. They got right onto scenting them up. A while back, Kirsten over at Kirsten & Co wrote this post – My DIY Bar Cart Project – and in the comments I mentioned I would check out Target to see if I could get me one of the gold pineapples. When visiting Shellharbour to see Take That live back in July, I did drop into Kmart and they did not have any gold pineapples left. They did have metallic pink ones, but every single one was slightly damaged. With my Kmart pineapples I bought as gifts for family, I regularly visited until I found a non-damaged pineapple. We have a Kmart nearby so regular visits was not a problem. With Target being a two hour round trip, regular visits were not going to happen. My friend who I went to see Take That live with suggested that I visit Pillowtalk to see if they had any pineapples. And it turned out, they did. The gold one was a little pricey for me at $49.95, but they are local and I can keep checking back until they go on special or on clearance which they eventually will. 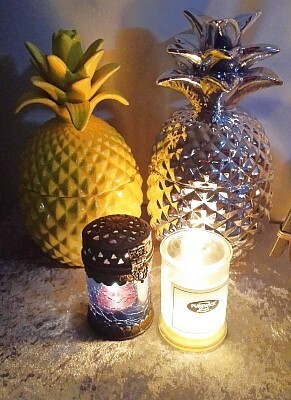 So, I bought the silver pineapple for $29.95 from Pillowtalk, and added it to my candle shelf in the entry way. I can see it from where I presently sit, reflecting the late afternoon sun rays from the sliding door. 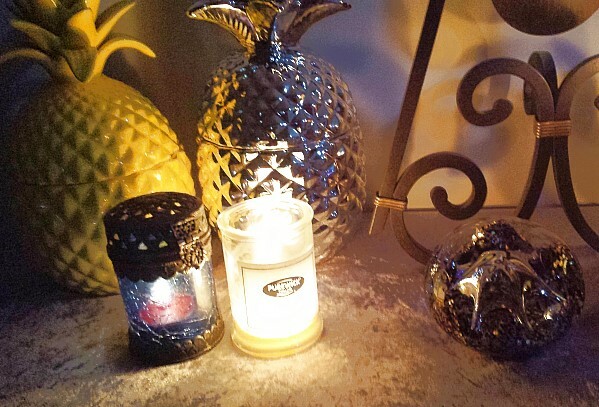 When it is night time, lighting the candles creates a lovely reflection from the silver pineapple, and also from the gold foil sleigh I have sitting on that shelf. The yellow one was originally a gift to my sister, but apparently it did not suit her partner and his design ethics and standards (alternatively it could be because he is an a**hole), and thus it was left behind when they went home after their visit. After all those visits to Kmart to get a perfect one, I figured it would fit in well at my house, though yellow might not have been my personal first choice of colour. They had white and jade ones too, once upon a time. I never saw a perfect jade one, I did find a perfect white one which I gave to my parents, and it now sits on their stairwell shelf. 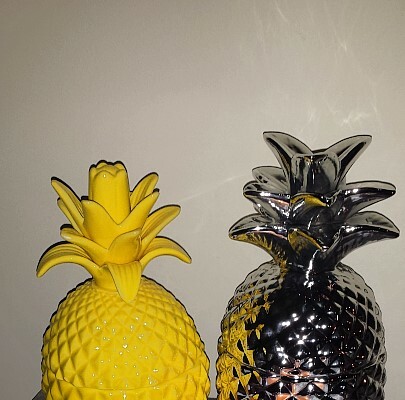 So now that I have two pineapples, I guess I am starting a pineapple collection. I’ve seen a couple of others I would like to add eventually, as well. 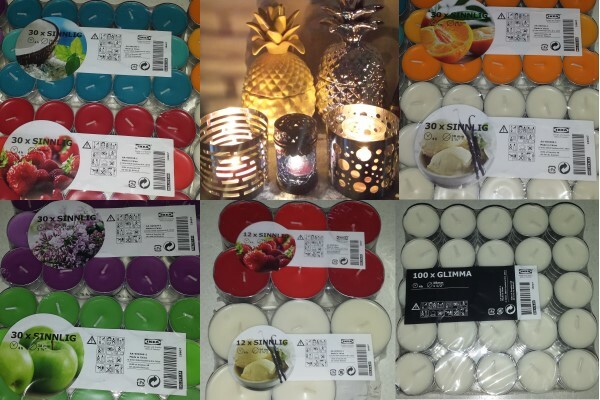 Kmart no longer stocks the pineapples, at least, not that I could find on my recent visits, otherwise I would still be trying for a jade one because that was gorgeous. I will like to mention, Happy Actual Birthday to Sephyroth today. 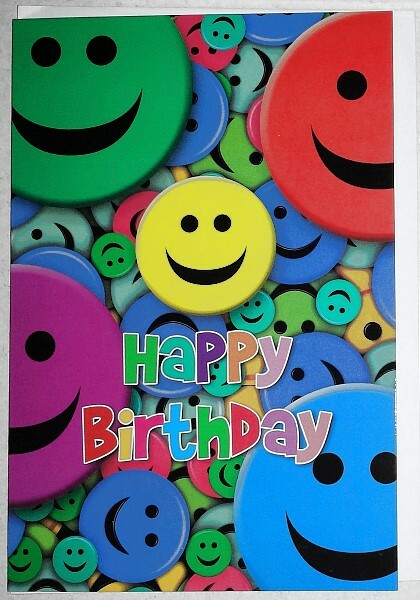 You may recall I changed his birthday to February, for reasons I explained in this post. Sadly though, the movie Triple 9 which was meant to be released today has been delayed until March 2016. I had zero plans to garden this year. Three Sydney Funnelwebs have been found on this property since Autumn. For those of you not familiar with this creature, it is extremely venomous and quite aggressive. Never fear, there are no spider images here. I would not do that to you! Arachnophobes know better than to post certain pics as a surprise to other people. 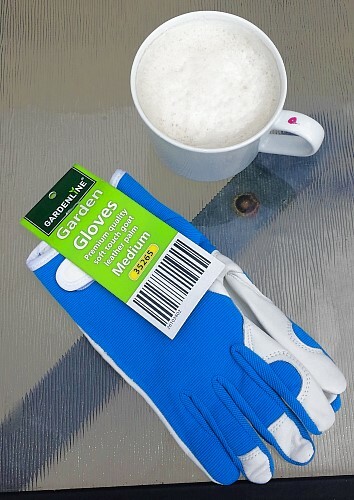 But then, I saw these gorgeous gloves at Aldi, and I re-thought my zero gardening plan. Maybe I would feel more comfortable wearing a pair of substantial gloves. We tried them on – The Other Half got large ones, my hands fit perfectly into medium. My zero plans were quadrupled into “no *#@!&*%$ way am I gardening this year” when two absolute nitwits posted images on a local community group of Sydney Funnelwebs they had found out and about after the floods. UNSUBSCRIBE ME URGENTLY! I left both groups. Life is way too short for spider images on my Facebook feed. The damage was done, though. My skin crawled for an entire week. Not cool at all! These people had put these creatures into plastic containers with sawdust, which implies keeping the creature long term. That freaks me out. Plus I feel like it is a bit cruel to the spiders. Not quite as cruel as what my chickens do to them which is dead them and eat them. But if they are found on my property, I’m backing the chickens 100% – dead them and eat them, girls! Gardening this year was back on my agenda despite the images, because the chooks have been getting plenty of free range time and they have been spending a lot of it in the garden bed. I’ve compromised with a – sort of – gardening plan. I decided to put some baby spinach, silverbeet, and brussel sprouts into the large planter box. I’m not sure how it will go because last year the kale was a massive failure in there – many moths laid eggs on it and they never grew the way they should have. I might end up screening this planter box in, if that happens again this year. Into the large garden bed, I planted two Nasturtium plants. 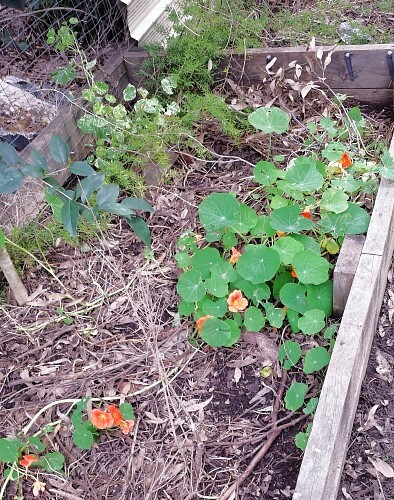 There is already one Nasturtium down the back and when the chooks are in the garden bed they mostly leave it alone. 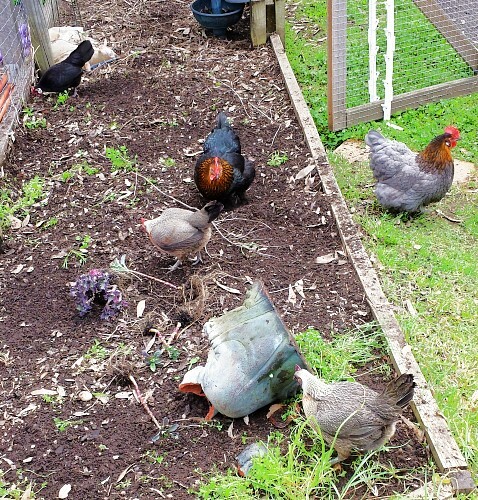 There are bugs to dig for, ain’t no chook got time to be eating plants! If I pull some out and throw it into the chook pen they gobble it up with great glee, because they have usually already eaten all the bugs in there before midday. I will buy any new varieties that I see of this plant because I love the flowers *and* humans and the chooks can eat it. 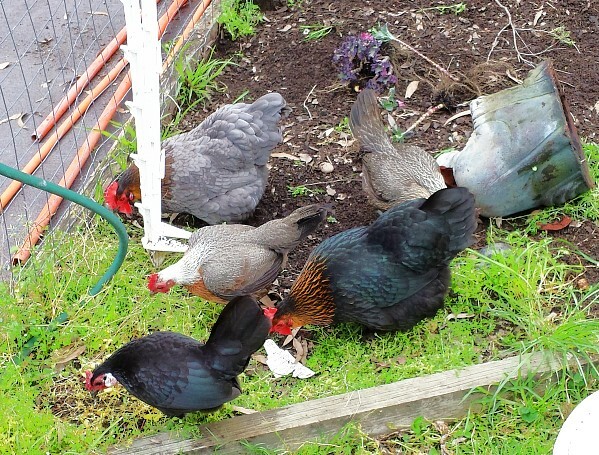 The chooks are on the lay again – on average I am getting 3-4 eggs a day. 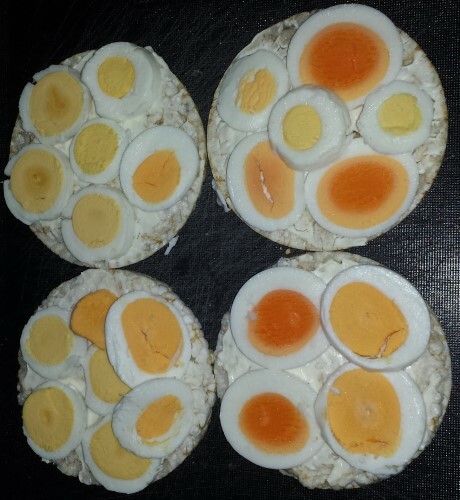 When I make my snacks, I sometimes mix a Manning Valley egg in with the girls small eggs, which are the largest ones they sell. If I were *not* an Arachnophobe, I would post a picture of this little orb weaver which I see every single day when I check the chook coop for eggs. It has found a tiny home in a small screw hole on the chook pen and every day when the sun rises, it folds itself into this teeny spot. I’m ok with certain kinds of spider making a home around the chook pen – they help with catching mosquitos and flies. Once I know where the web is, I am not likely to walk into it by mistake. The only thing that spider has to worry about is the chooks, who will eat any spider they see. Luckily they cannot reach where it is, nor could they see it unless he moved. It is well camouflaged. My little friend will find many tasty treats this spring and summer. 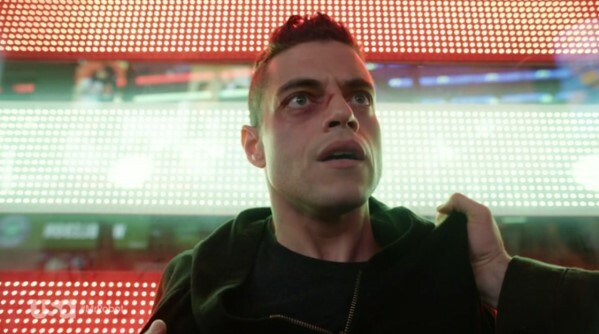 The Mr Robot finale was awesome in some ways, but also slightly disappointing in some ways. I think the extra week of waiting meant that my expectations were very high..
Alan Sepinwall said “What a fascinating, off-kilter, 100% “Mr. Robot” way to end this season” and on reflection I have to agree with that concept. I have not re-watched it yet purely because I did not feel ready to – I’m letting it sink in first. One thing I do know, that scene in Times Square was an enormous explosion of colour in a usually quite muted show colour palette. I’ve collected up a roundup of interviews and linkage for you. SPOILER ALERT – there are spoilers in these interviews. You do not want to click unless you have seen the entire 10 episodes of Mr Robot. Rami & Twin Sami on Jimmy Kimmel – Having a twin is a great way to figure out what you would look like with a beard and a different hairstyle. 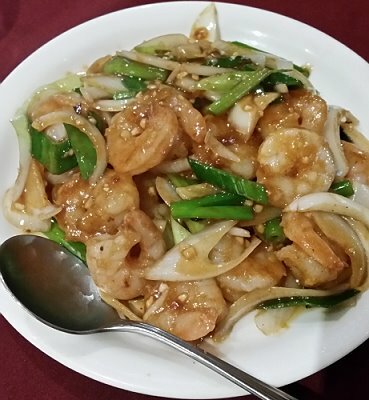 So… what did you think? – Sam Esmail asked what people thought over on Reddit and he also replied to a few of the comments. Just two cards added to the collection this month.